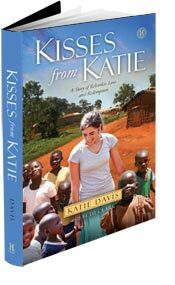 Throughout the book “Kisses From Katie”… Katie shares how God prepared her throughout life for what she is doing today. When I read her words, it speaks to my heart. I see a similar path I followed, in preparation of my future and how it led me to where I am. As a parent though, you can understand why one might be concerned… your child, who has everything going for her from a worldly standpoint – willingly changes their course of life, not just a little bit – but in an unimaginable way – just to obey God, while in the process disobeying you. If she doesn’t believe in a works based salvation… then why on earth would someone do that in this day in age? Give up modern conveniences, parental approval, and “worldly successes” for… what? To “follow God’s call”? Does that sound like a little TOO MUCH God to you? Well when God calls you to something – you know. It’s not that you don’t question … why? or how?… or “are you sure?” But deep down in your soul – you KNOW the answer He desires for you and anything else just isn’t going to work. It’s nothing of me. I’m NOT special. I don’t have super powers… and I truly don’t think of me as “doing” any thing as anything other than obedience to His call for us. Sure, we could have chosen other things – but that wasn’t our calling… and not each call can be the same. God uses ordinary people – He always has. That is all I am. Just like you. AMEN. That about sums it up for me. So, when you’re feeling like you can’t say NO to that temptation of food… or you’d rather say NO to exercising. Remind yourself that you’re saying YES to God, and His plan for your health. It’s okay to say no to things… it means we’re saying yes to something else. Self-denial is unconventional for sure… but sometimes it’s really worth it. Posted on February 7, 2012, in Change, Our Struggles, Truth and tagged healthy eating, healthy for God, healthy for him, Kisses from Katie, portion control, working out, worship in body. Bookmark the permalink. Leave a comment.